"I am not looking for a great Victorian poet: I am looking for a great poet who lived through the Victorian period." Chris McCabe has been wandering around West Norwood Cemetery in search of dead poets for his new book. He wants to find a voice that speaks to modern readers — one which was ahead of its time, that we're finally catching up with — and London's Magnificent Seven burial grounds are his search area. West Norwood is the first; he identifies 12 writers at rest in the grounds and sets out to visit their graves, work in hand. The lives of these largely forgotten poets mix with some of the greater names of literature: Charles Dickens, Edith Nesbit, Anne Radcliffe and Laurence Sterne (the latter two, rumour holds, had their bones moved to West Norwood, although this probably isn't actually true). For the nerdy or just plain curious, there's also an extended and — appropriately for a book by a poet — visual exploration of the echoing catacombs, where the coffins are splitting apart and, if you're not careful, you could end up getting your hands covered in smallpox or anthrax. As we've seen before with Chris McCabe and his work Shad Thames, Broken Wharf, he's at his best when conjuring a sense of place; even during the more biographical sections he manages to evince the wistfulness of the cemetery. This is a book thick with research, presented with beautiful prose and a poetic heart. We can't wait for him to visit the other six. 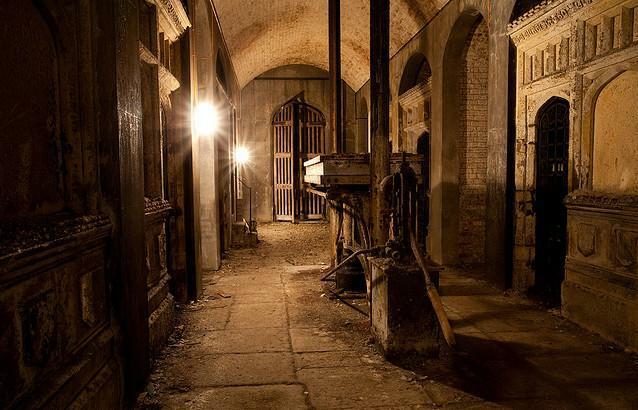 In The Catacombs: A Summer Among the Dead Poets of West Norwood Cemetery by Chris McCabe is published by Penned in the Margins. RRP £12.99. Buy direct from the publisher or find your local independent bookshop.